Having lived in the same community for 19 of my 41 years, I can attest to the small town atmosphere which Wendy L. Young established in her book, Come the Shadows. Everyone knows each other but, sometimes, that same familiarity breeds contempt and gossip spreads like wildfire. Of course, where missions are concerned - when people unite on common ground - there is no greater blessing than having people supporting each other through thick and thin. Like any town, big or small, Campbell Creek is complete with the good, the bad and the ugly. However, in Come the Shadows - in terms of stress factors - it doesn't matter if people are on the right or wrong side of the law; everyone deals with some form of stress. The story took me to many places, from a beloved pie shop to a mental institution, to the warmth of a loving family's home to a prison and beyond. I was able to relax and enjoy the small town atmosphere and getting to know some beloved characters and witnessing precious moments of their lives. However, I could feel the shadows creeping in after a skeleton was found in an abandoned factory and developers wanted to move in immediately. It spoke of something sinister and I must admit that it was my pleasure to see this story through. 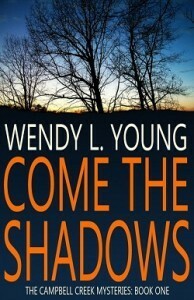 Come the Shadows offers great balance - between good and evil, offering relaxation and suspense. Even when wanting to read the rest of the story right away, I was able to put it down when the hour grew late because of the way the author ended some of her chapters. It seemed Wendy L. Young wrote this book with the working person in mind. After all, it's good to read a page-turner - which this book definitely is - but it's not so great when the work day drags on and it's hard to focus due to lack of sleep. I definitely look forward to reading other books which Wendy L. Young publishes in the future. If you would like to learn more about Come the Shadows, please feel free to click the book cover which will take you to its page on Amazon.